Referral contests are the industry favorite for a reason – not only do they drive customer engagement, but they also expand your customer network. The newcomers aren’t adventitious either. The ‘referral’ aspect of the practice ensures new customers already have social proof attached to your brand. In this post, we’ll take a closer look into a great example of a sweepstakes campaign done right that has generated over 325,000 emails in less than 4 weeks. The main actors – HolidayPirates and their crew of buccaneers, powered by Maître. HolidayPirates is one of the fastest growing online travel companies in Europe. How fast is their growth exactly, you might wonder? Quite impressive – Founded in 2011, today HolidayPirates has over 10 million likes on Facebook alone. One of the ways HolidayPirates amassed this hefty following is through sweepstake giveaways. This time, they chose the perfect prize – a $5,000 worth of booty that the luckiest pirate could use to travel anywhere their heart desires! HolidayPirates run a total of 9 simultaneous campaigns in different regions – Italy, Germany, The United States, The United Kingdom, Spain, Netherlands, Austria, France and Switzerland. The raffle system was a perfect blend of a sweepstake and a referral contest – for every friend that signed up for the HolidayPirates newsletter, the customer would gain 10 additional entries. The more they referred, the higher their chances were to win the attractive prize. The viral sweepstake campaigns they recently run with Maître resulted in an incredible average referral rate of 21% – gaining them exactly 325,234 subscribers. Impressive! Getting the campaign of these proportions ready is not an easy task – there are just so many things to do. However, HolidayPirate handled it well. Implementing the highly customizable Maître tools, they created a separate landing page the applicants would use to make an entry. The landing page was both effective, and in the classic HolidayPirate character. The result was a success. When a customer made an entry, they’d get an automation welcome email. The email would let them know that their entry is in the draw to win and explain the benefits of referring a friend. Under the explanation, they put large social sharing buttons. A follow up email reminded them of the benefits of sharing. After a referral went through and their friend entered the sweepstake, the customer would get an automation email again. This time, the email would let them know their chances of winning were just boosted for 10 entries, and that they can repeat the process to heighten the odds of winning. Finally, they’d set the date – telling the customer when the winner would be announced – creating the sense of urgency. The result – Maître’s Automation emails HolidayPirate used boosted customer engagement by 30%. Nobody expects sweepstakes to work this well. Why? Because in traditional sweepstakes, people don’t want others to enter. Remember – sweepstakes usually have only one, or a few high-value prizes, so not a lot of people can win. More entrees would mean more competition, and lower chances for them to win. Nobody likes that! So, what makes Maître Viral Sweepstakes different? The more referrals a person got – higher the odds of them winning! The people have a reason to invite others to join in on the fun. Mary has found a great deal for a vacation to Spain on HolidayPirates.com last year, and she’d really like to go again, but the only way for her to afford the trip this year is by winning the raffle. At first, Mary might follow the good, old sweepstakes logic – the more people in the raffle, the less likely her entry is to win. But this logic doesn’t work here. It’s true that the more entries there are, the lower the chance of Mary winning the raffle are. However, in Maître’s viral sweepstake system, Mary has a way to gain a significant boost – by getting 10 more entries with her name on into the raffle. The way to achieve this is very simple and easily accessible – all she has to do is click the button in one of the emails she received. So, she decides to send a referral to a couple of people, including Robbie. Once Robbie sees the invitation and figures out how it works, he’s immediately swayed. Because he received the invitation from Mary, he doesn’t shrug it off as spam. Taking a closer look, Robbie decides to enter. After all, not only does he help his dear friend Mary, but he gets the chance to win the attractive prize as well! The referrals gained this way are, of course, the heart and soul of the referral contest. There are quite a few reasons HolidayPirate’s campaign was this successful at getting their existing customers to share their contest. The fact that their chances of winning were heightened manyfold was only one of them. 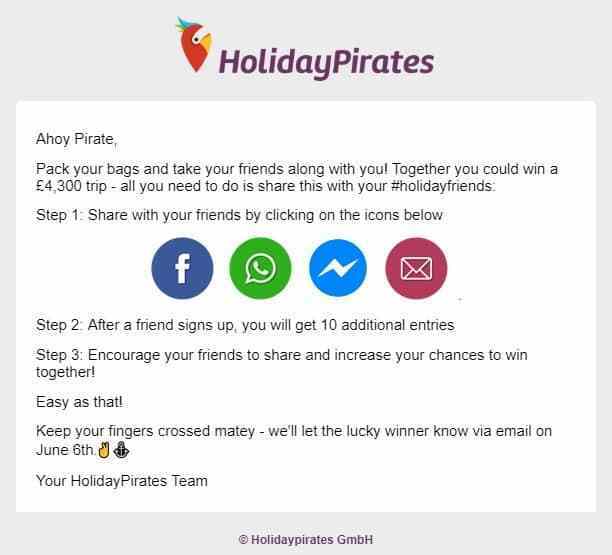 While the incentive is important, the format HolidayPirate’s email applied made it easy for them to share – they could do so with only a click of a button. When making their Automated email with Maître, HolidayPirate could implement the social sharing buttons for Facebook, WhatsApp, Facebook Messenger and Email in a simple and intuitive way. We think the most important part was the prize itself and the campaign theme. Also, users were getting extra entries for every referred friend. Using Maître’s email templates (e.g. follow up email) and incorporating sharing icons pushed the referrals as well. As the crew mentions, the campaign theme played an important role in ensuring the sweepstake is attractive to customers. The copy HolidayPirates used in their Maître powered automation emails is charming to say in the least. Following their pirate theme tightly, they added a lot of flavor into the emails with swashbuckler lingo and a friendly approach. Remember, personalization is key in customer relations. The people your email will reach are not mindless zombies programmed to follow through any Call to Action they come across. They are individuals with personality and a sense of humor, so no need to be too serious! HolidayPirates nailed the voice of their copy. It’s both informative and amusing, with catchphrases following the general theme. It’s no wonder HolidayPirate’s campaign was a raging success. The people got emails that were enjoyable and seemed tailored just for them – in the lightning speed of automatic emails. Hint – it’s not only because they too would be eligible to win (though that did play a part). The fact that the invitation to sign up comes from someone they know created social proof – a psychological mechanism that many marketers swear by. Robert Cialdini, an Arizona State University professor, and a visiting professor of marketing, business and psychology at Stanford University, lists social proof as one of the seven principles of persuasion. Influence, he found, is among other things based on social proof and unity – the better we can identify with others, the stronger their influence on us. 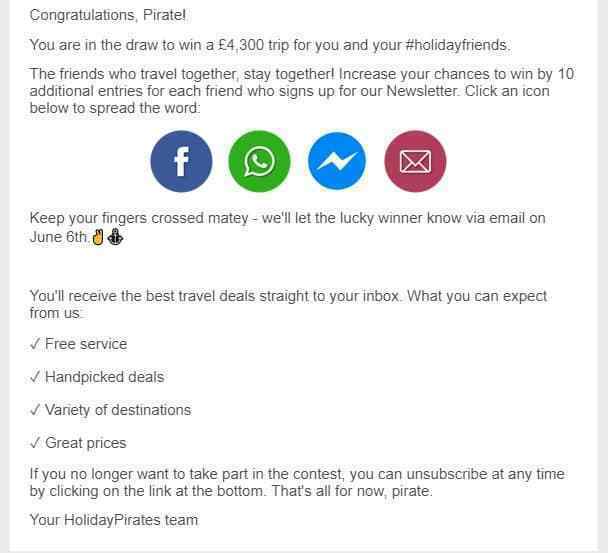 So, not only did the friends of HolidayPirate’s existing customers feel compelled to enter the draw in order to win the prize, they also had an initial spark of trust and confidence in the previously unknown travel company. This way, the customer doesn’t have to worry about being scammed, and the companies don’t need to fret the spam filters. Referral competitions are always a win-win situation, because the prospective customers don’t need to question the validity of the offer, and the companies don’t have to go out of their way to prove good business practice. Trust is virtually instantaneous. Well, if John, one of the smartest people I know, trusts this company, there’s got to be a good reason – no hornswoggle here! Persuasion through social proof at its best! Still, no matter the size of your network or the loyalty of your existing customers, winning is still the primary reason people enter raffles and sweepstakes. In this case, the prize was a great choice – in fact, time and time again, it proved to be the single best incentive for HolidayPirates’ target audience. The $5,000 in travel funds is exactly the type of prize a person vying for a vacation would want. Holidays are, after all, the main reason someone would be interested in this type of a business. Of course, even the best ideas need some tweaking to yield the best results. In order to reach the full potential of their campaigns, HolidayPirates used the Maître advanced analytics to bring decisions based on data. Maître has analytic tools which help you track different types of data in real time. From information on specific participants, through referral insights to stats and info on the promotion channels. It’s easy to track it all: visits, actual conversions, and referral, and finally gain insight into which promotional channels work best for you and your target audience specifically. The analytics are presented in both raw numbers and graphs, so it’s easy to make informed decisions. We liked that the interface was really simple and easy to handle. You could customise most features according to your needs. Also the analytics page was quite nice. You had both day-to-day analytics and overall numbers (regarding participants, referrals and promo channels). You also could implement the Maître tracking parameters that helps compare the performance optimize on that. Not only could they track the referrals and use automatic weighing to make a fair winner draw, they could also make sure that they quickly got rid of the entrees who wanted to game the system. After all, upholding fair play is a priority. Maître’s anti-fraud algorithm tracks activity and updates the assessment of risk levels of individual applicants in real time. This means that HolidayPirates could get rid of bots and cheaters quickly and effortlessly. The most important takeaway is this: amazing results are not reserved for the big-shots. With the referral rates ranging from 18 to 27%, and the final number of new subscribers reaching 325K, it’s obvious that HolidayPirates’ campaigns were a raging success. Creating an outstanding referral contest has three main ingredients – a strong incentive, powerful analytics and flawless execution. While you should rely on your own knowledge and experience to choose the prize that your target audience will love, Maître is there to take care of the rest. If you’re ready to create a result-yielding Sweepstakes campaign in a matter of minutes, welcome aboard! And if you’d like to learn more about how Maître works, you can book a meeting with us here.